David is featured in the latest issue of the Radio Times (29 Jan - 4 Feb 2011) which is out now. How To Train Your Dragon feat David Tennant as Spitelout is nominated for Best Animated Film at The Oscars. It is up against Scottish made film The Illusionist and Toy Story 3. 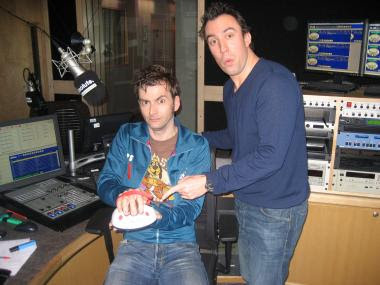 David will be a guest on this Saturday's (29th January 2011) Christian O'Connell Show. The show is broadcast on BBC Radio 5 Live from 09:00am - 11:00am and you can also watch Christian O'Connell's show live on your digital TV every Saturday morning. Just press the red button on your remote control from any BBC TV or Radio channel. David was at last night's British Comedy Awards to present Miranda Hart with the People's Choice award. If you missed it The Britsh Comedy Awards are repeated tonight on Channel 4 at 11:00pm and one hour later on Channel 4+1. You can also watch the awards via 4OD (UK only) here and David was also interviewed on The British Comedy Awards: Live Lock-In which can be seen here. Thanks to Dom for the above video. Karen Gillan, Rob Brydon, Rachel de Thame, Nick Park, Alex Jones and more attended this year's famous Radio Times covers party - the private bash where celebrities who've earned an RT cover during the previous 12 months are presented with a framed copy. Filmed in central London on Tuesday night, host David Tennant welcomes you to the only video taken inside the actual event. You can't buy your way into this buzzing party and you can't talk your way in - though press and paparazzi had a good try again this year! - but now you can see the fun for yourself. You can see tonnes of photos of David from the event on the Radio Times website here. You may remember a few months ago that David mentioned that he may have been involved with a musical? Well some interesting info comes via Doctor Who composer Murray Gold. Murray is currently working with BBC Radio 3 on his new project Kafka The Musical. 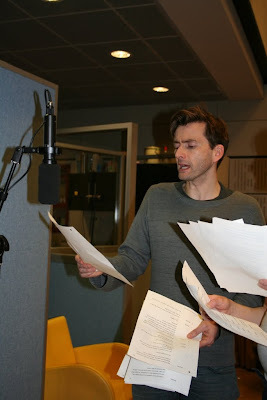 He posted a photo of the cast list on his twitter page which you can see above and if we're not mistaken his carefully placed finger is hiding none other than a certain Mr David Tennant, it's someone he describes as "one of my favourite actors"... Hmmm... No official word on it yet, but we're pretty excited! You can follow Murray Gold on Twitter here. David has narrated a new docu-drama for BBC2 (Scotland) entitled The Father Of Australia. It will air onWednesday 26th January at 09:00pm. TV Listing is as follows: Dramatised documentary charting the story of Lachlan Macquarie, the man who, in 1810, became Governor of the British colony that would later be Australia. 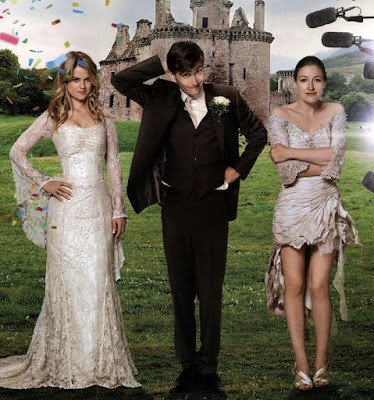 Narrated by David Tennant. You can watch a clip from the show at the Caledonia TV site here. The Royal Shakespeare Company will be holding a Costume Sale on Saturday 12 February at its rehearsal rooms in Stratford-upon-Avon. Around 10,000 items including costumes, shoes, hats and accessories will be available to purchase. The sale includes over 1,000 pairs of shoes, 500 shirts, 300 hats, Egyptian head-dresses, a variety of military uniforms, cloaks, clerical outfits – including nuns and priests, jewellery and chain-mail. The items cover a wide range of periods, including retro, vintage, Early English, Elizabethan and twentieth century. The garments in the sale, originally constructed by the world renowned RSC Costume Department, have been chosen from the RSC Costume Store (which hires out RSC costumes after they have finished being used in its productions). David Tennant will be hosting tonight's Radio Times Covers Party in London. If you want to keep up with what's happening at the party then you can follow @radiotimes on Twitter. Watch David and Catherine's announcement that they will be appearing in Much Ado About Nothing together on BBC Breakfast above.Thanks to Dom. 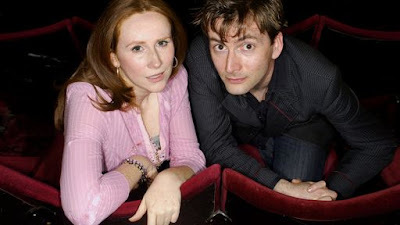 David and Catherine Tate have today confirmed on BBC Breakfast that they will be starring as Benedick and Beatrice in Much Ado About Nothing at the Wyndhams Theatre from 16th May 2011. Booking is now open on the Delfont Mackintosh website here. Another number to try 0844 482 5138. If you have had tickets selected on the website and it's failed select option 2. People with access requirements can to call 0844 482 5137 See Tickets 24 hours ticket sales hotline is 0870 264 3333 If you're in London the Box Office is open from 10am - 7.45pm for you to purchase tickets there. Wyndham's Theatre, Charing Cross Road, London WC2H 0DA Got your ticket? Log your attendance on our Facebook events page here. David and Catherine Tate will be on BBC Breakfast this morning at approx 09:50am to announce an exciting new project that they are working on together! You may all remember our RSC competition to attend a special event on 5th December 2010 in the new Royal Shakespeare Theatre for seat donors..the winner was Ella Humphreys who has kindly sent in some pics of the theatre and David's plaque. Back in 1998 David was featured in The Golden Triangle Part 2 - The Order Of Release which was the second of three plays about painters broadcast on Radio 4. 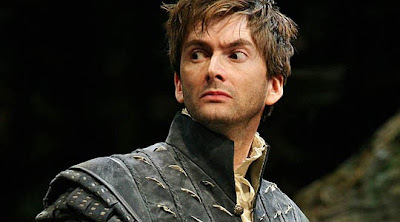 The Order Of Release was the only play that featured David. You can download it here. Many thanks to Lora Colver, Spafon7e and Soophelia. DAVID TENNANT has revealed he was desperate to star in a new football drama - despite not being a fan of the game. The former Doctor Who will appear in upcoming BBC film United, The Busby Babes, about the 1958 Munich air crash. Tennant, 39, plays Manchester United assistant manager Jimmy Murphy, who takes over the team following the tragedy, which killed eight players and left boss Matt Busby seriously injured. Tennant said:"I am famously not that much of a football fan at all, so when the script arrived I didn't think that it was going to be for me. "However, it really knocked me back and the emotional power of the story is what hooked me. "The way I saw it was if it was affecting me, then it's one that is going to get to everyone." Fellow Scottish actor Dougray Scott, 44, has signed up to play Busby. 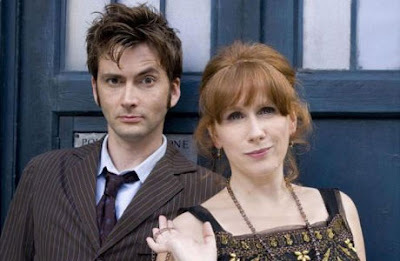 There's lots to look forward to in the year 2011 for all you Tennant Fans out there! David will be making appearances in three...count 'em... feature films over the next 12 months and there's bound to be more exciting news too!! Doctor Who: The Day of the Troll (Unabridged) is now available as an audiobook from Audible.com. The book, published by BBC WW and written by Simon Messingham, has also made Audible.com‘s Top 2000 Best Sellers List for the month of November.. The audiobook version of Doctor Who: The Day of the Troll (Unabridged), narrated by David Tennant, has received an average rating of 3.96. The title has a run length of 2 hours and 17 min. The book was first released in October 2009 and a sample of the audiobook is available for download.